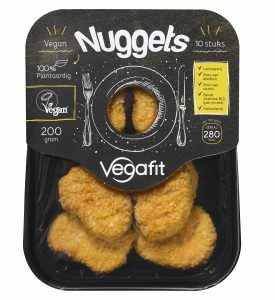 The 100% plantbased nuggets are nice and crispy and have a firm bite. A perfect snack! hydrated 37,1% wheat protein, breadcrumbs (wheat flour, spices, salt, yeast), sunflower oil, onion, water, wheat flour, potato protein, mustard (water, mustard seed, vinegar, salt, sugar, spices, herbs), salt, sugar, potato fibre, thickening agent (carrageenan), modified starch, maltodextrin, wheatfibre (gluten free), yeast extract, spices, celery extract, celery, vitamin B12, iron, zinc.